Mikazuki is my second favorite touken danshi back when I was still in the series and since I got his normal version by Orange Rouge and felt he was worth what I paid, I decided to snag the damaged version when I was on my previous trip to Japan! 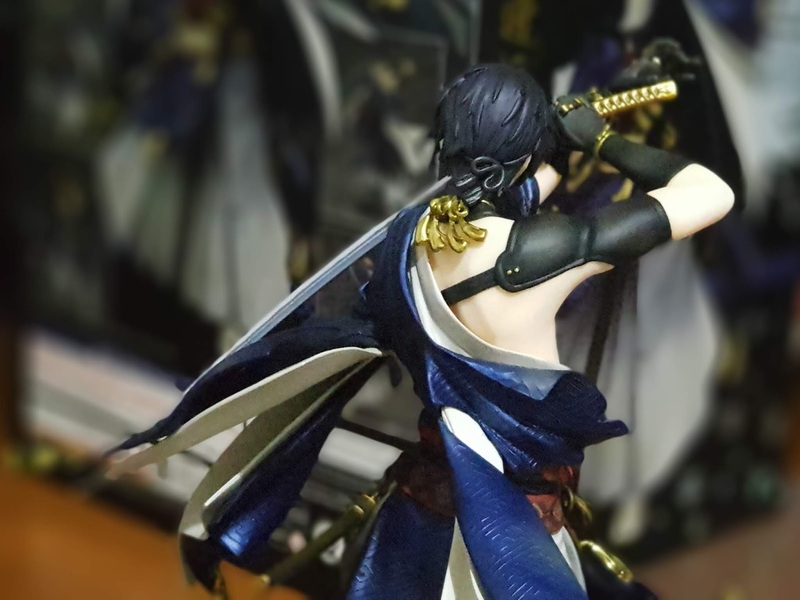 For those of you who are wondering what a ‘damaged version’ is, it’s based off of an illustration that cuts into the game when Mikazuki’s health bar drops too low. 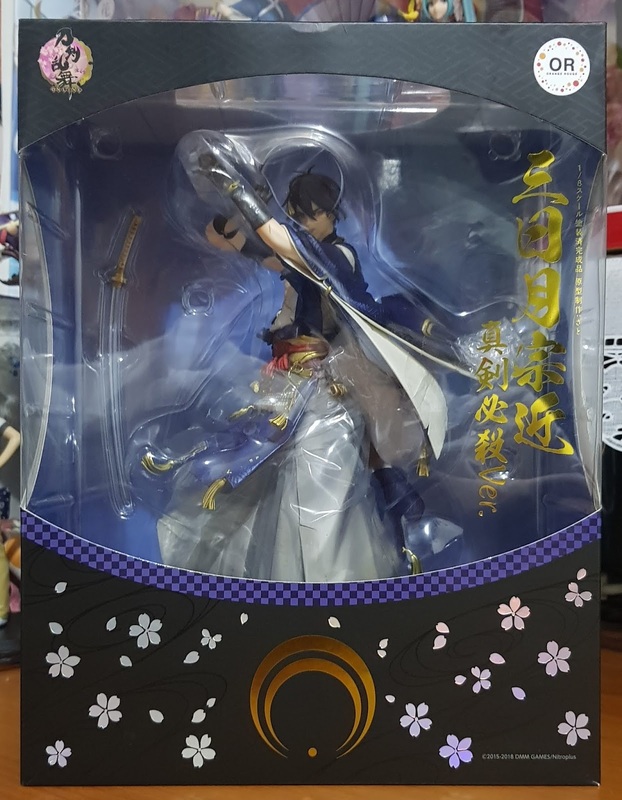 Comparing this to the normal version that is based off on the illustration of the player’s first meeting with Mikazuki, the damaged version would appear a lot more dynamic and ragged. 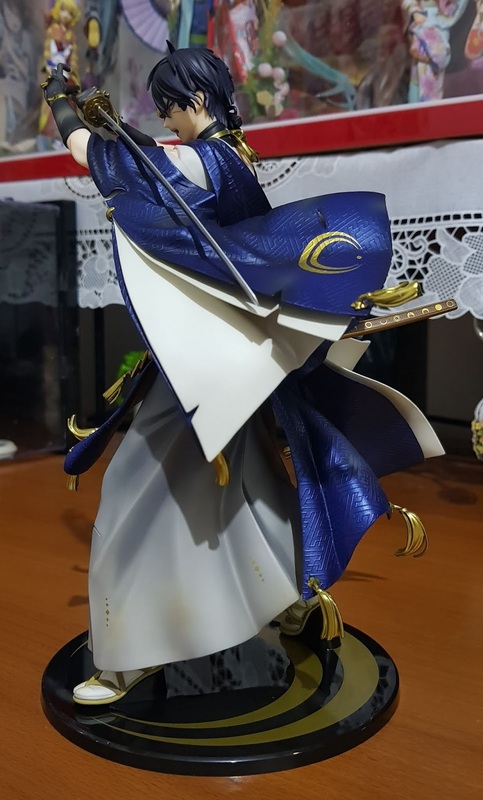 While the ‘damaged version’ is one of my least favorite illustrations of Mikazuki, it appears that Orange Rouge has no plans to make a ‘battle version’ so I decided to satiate my need for more Mikazuki figures with this version. I’ll say it right off the bat that I prefer the normal version a lot more than this version, although I’m usually one for more dynamic poses. 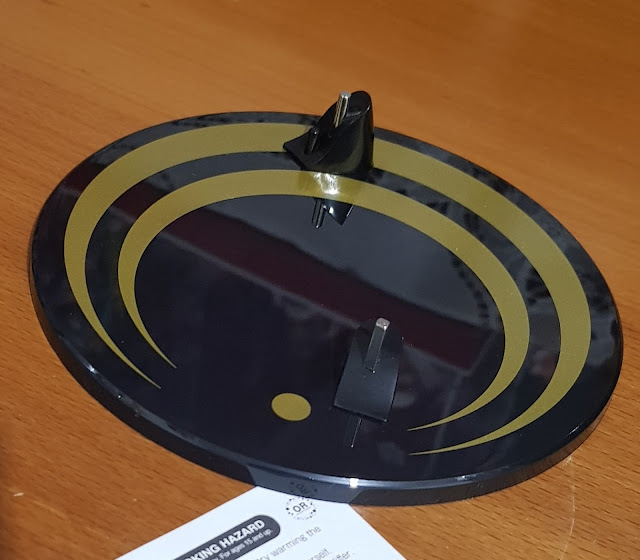 I’ll insert my explanations for this in the review itself so let’s move along! 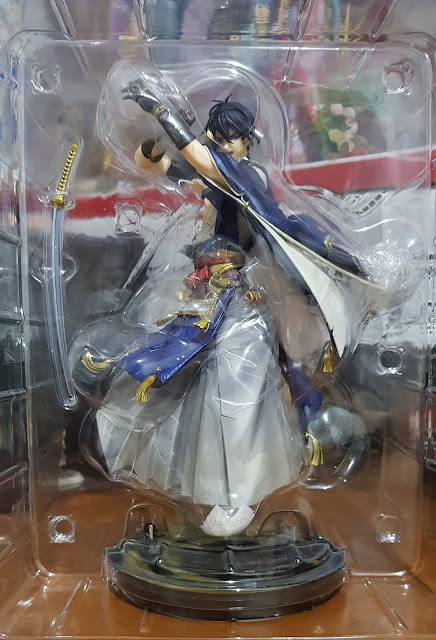 Firstly, the box and pose for both versions are very similar. Both comes with a similar box design and crest on a round black base. If you are choosing one version over the other, you wouldn’t be missing out on anything on these aspects. 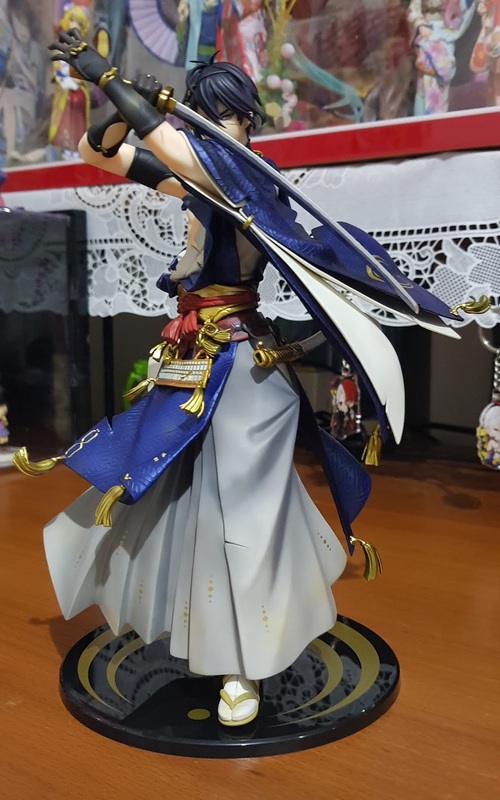 However, I did feel that something was missing for the damaged version, as such a simple pose did not match his dynamic pose. 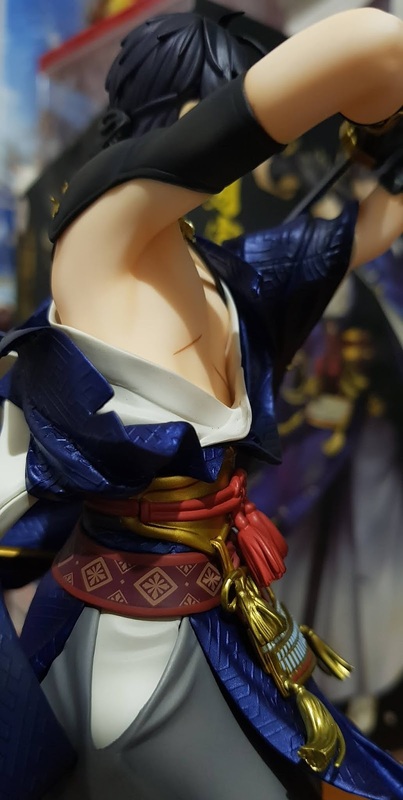 The damaged figure also came with specks of dirt on his hakama (which suggests that Mikazuki is engaged in a fierce battle… possibly on a sandy ground), but there is absolutely nothing on the base to help draw a conclusion. Secondly, his pose. 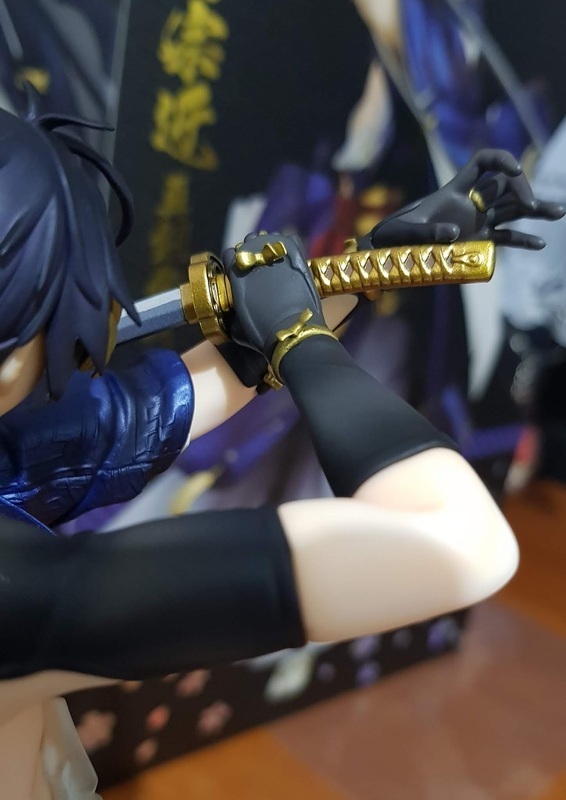 As this is a striking pose with Mikazuki’s head tilted down slightly, and his arm and sword blocking most of his facial features when viewed from a lower pose, this figure does not do very well when viewed from eye level or slightly above eye level. This makes it very difficult to find a fitting place for him in my current display. An additional point would be the painted-on dirt specks on his hakama which could either be a hit-or-miss with collectors. Some prefer their figures to look pristine while others fancy the touch of realism to fit the battle-esque pose. 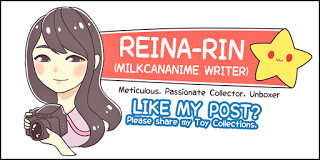 However, I’m sitting on the fence for this since I like how it ties the pose and context together, but that sentiment falls short with the lack of a diorama base. 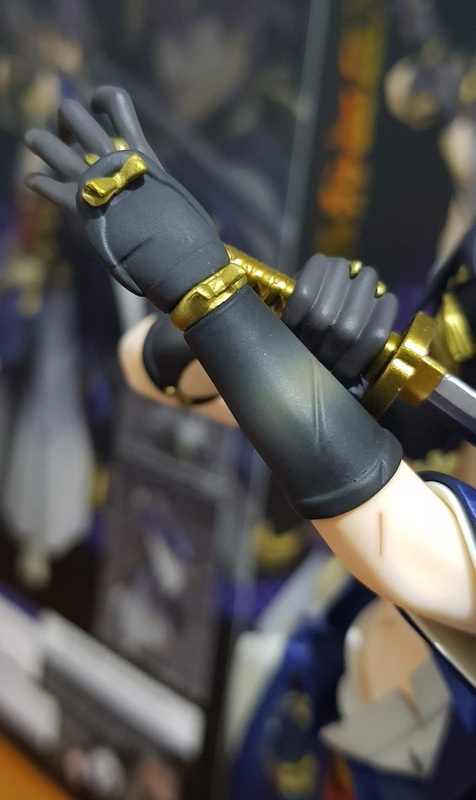 Also, while the golden hilt and sheath of the sword is sculpted and painted well and appropriately, the blade is painted rather awkwardly, with a slight metallic sheen which doesn’t match the gleaming katana we see in anime. 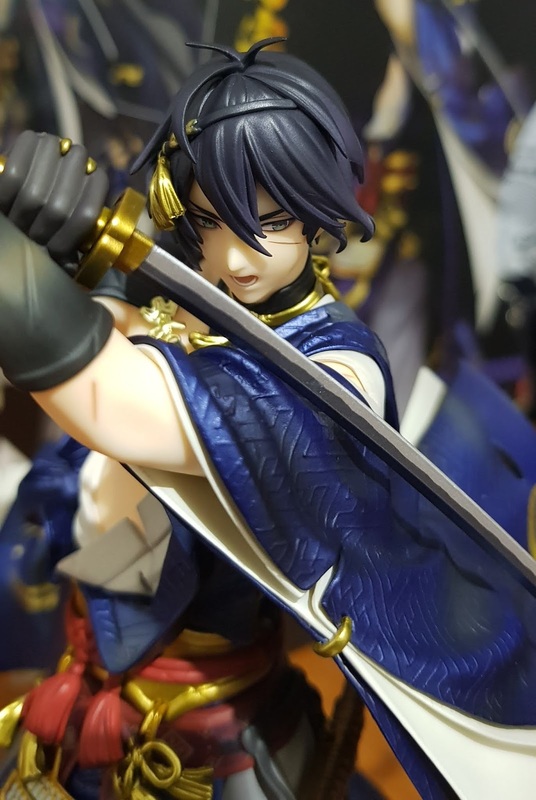 The hilt of the sword was also rather difficult to push into Mikazuki’s hands and it doesn’t help that the blade is made to be quite flexible. 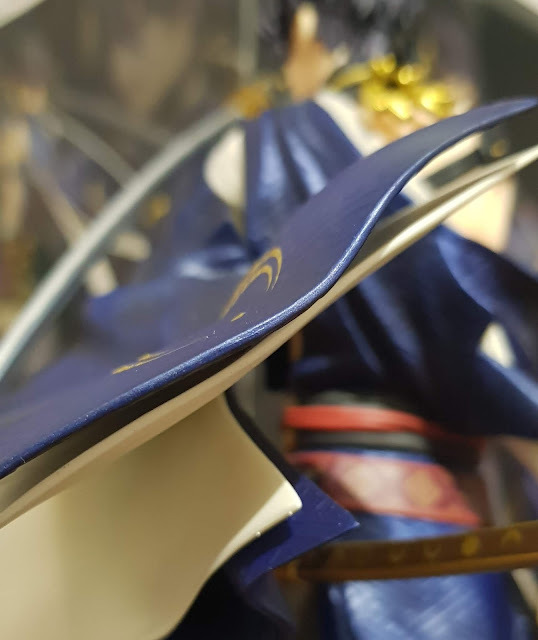 I felt that Orange Rouge should have taken one more step and separated the hilt of the sword from the blade so there is less risk of damaging the accessory when assembling the figure. Other than the aforementioned four points, I do feel that this figure is really well-made, and does not look bland in any way to the normal version. 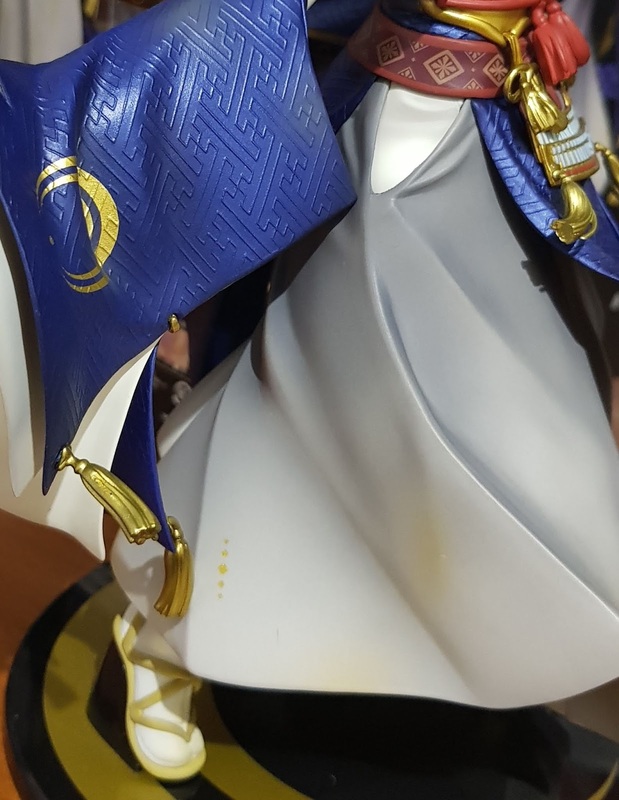 One aspect that I genuinely loved about the normal version is that the pattern on his outfit are all sculpted on and that makes it stand out well when it refracts light. This version has the same treatment, which is a plus in my book! 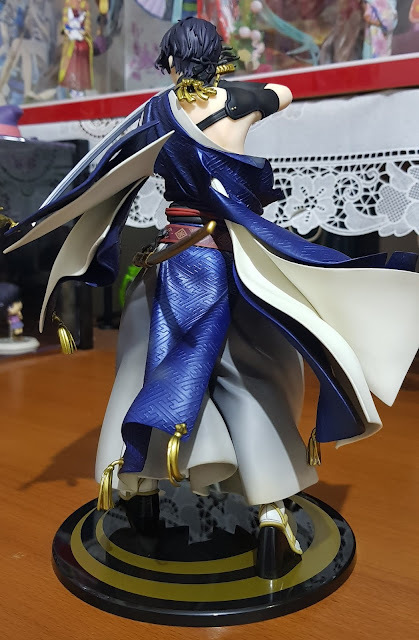 The sleeves and layers of clothing look a lot more dynamic here as he is sculpted to look mid-motion. 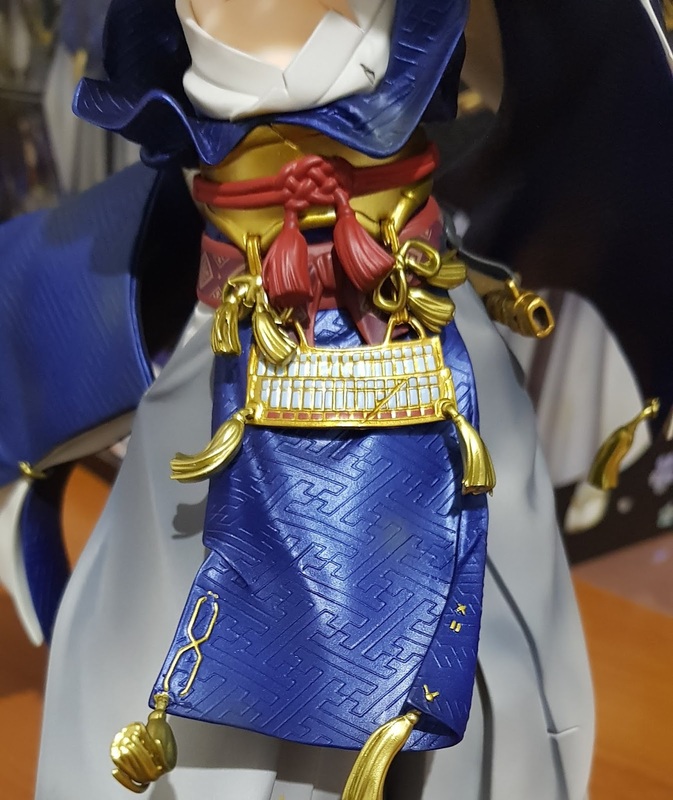 The billowing out of his sleeves help to highlight all the different layers of his clothing that you could hardly catch a glimpse of in the normal version! 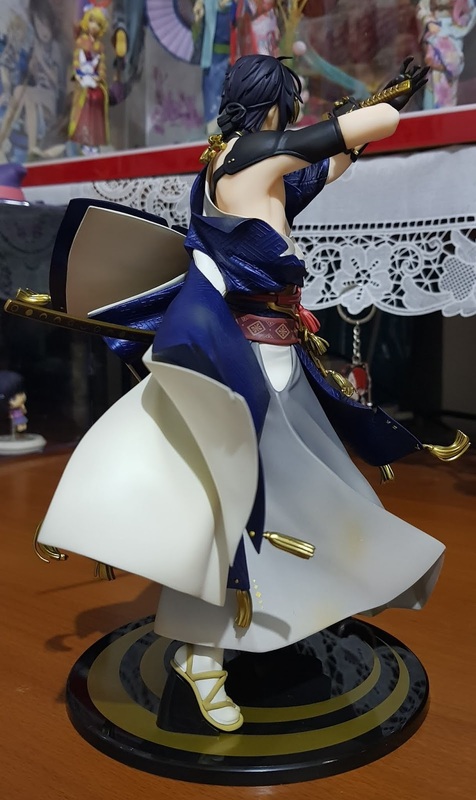 If you are into catching a glimpse of bare skin or lean muscles, you can get your fix with this Mikazuki figure as you are able to get a full view of his right arm and half a chest as his sleeve gets torn off in the heat of battle. This also reveals the armor he wears around his shoulders and wrists which are perfectly hidden from view in the normal version. 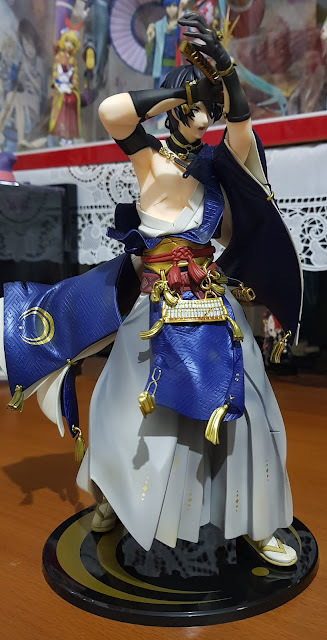 So, if you love bushido as much as I do, it pays to get this figure to understand how these shoulder and wrist guards work in the olden days. The gold tassels at the edge of his clothing are also looking a lot more dynamic in this version than the normal version. 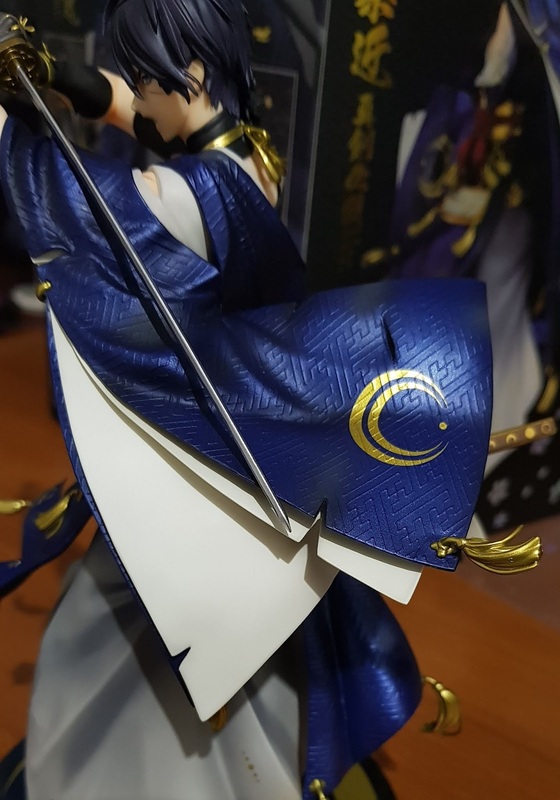 They are sculpted swishing in different directions and some corners of his clothing are even raised so it reveals the stitching done to hold the tassels in place! You can also see some tassels that are usually hidden from view! 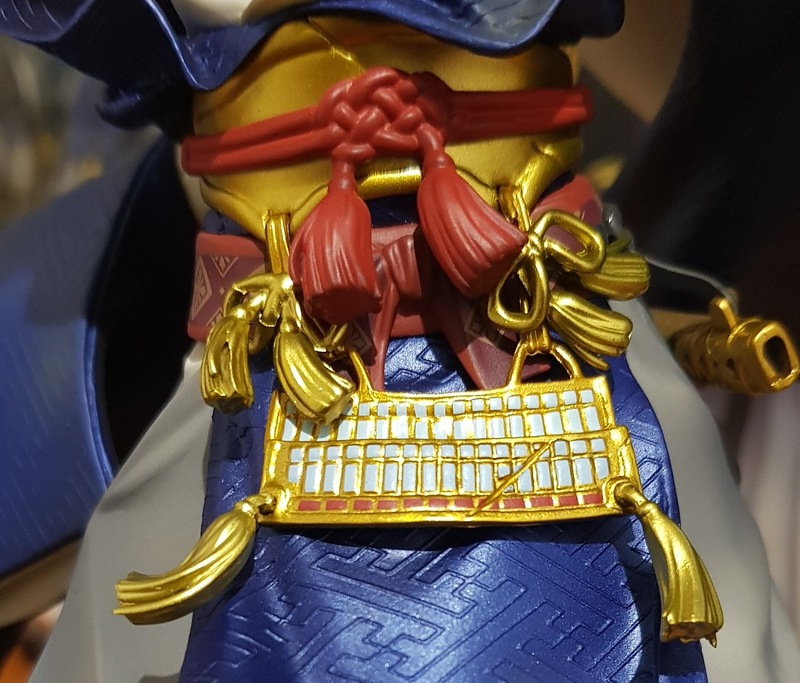 Some of the pristine gold plates you see on the normal version of Mikazuki is also scratched and broken here, and you can spot the extra steps and effort taken to make the damage look as realistic as possible. Some of the white plates are also missing here to add to the ‘damaged’ look! Speaking of the damaged look…the figure is clad with well-placed cuts and tears in clothes. 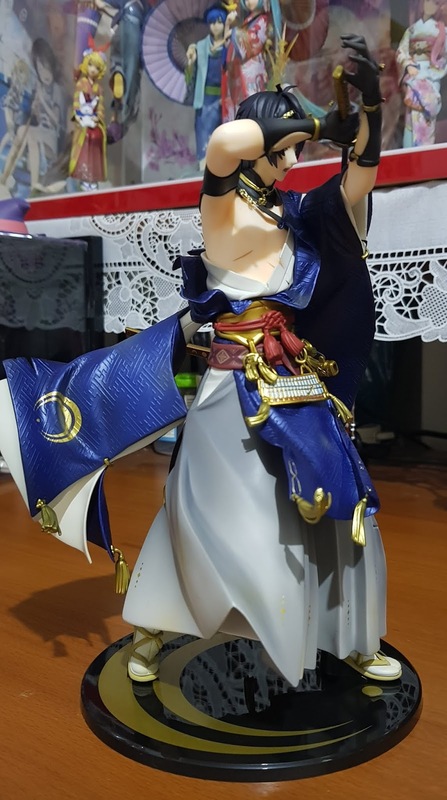 There are also several dirt stains around his grey hakama part to further intensify the atmosphere of the figure. 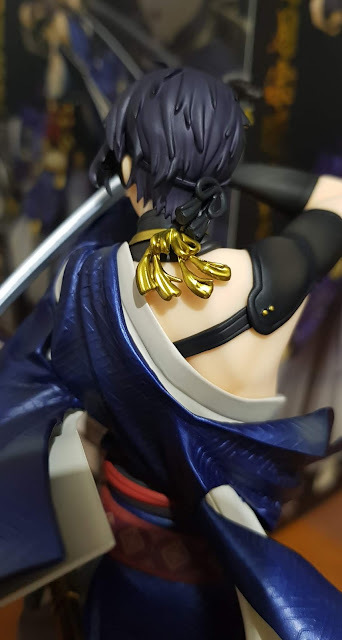 This create a slight difference from the normal version of the figure as most of the other details for his hakama are kept consistent. But surprisingly, despite the huge damage to his top and dirt on his hakama, Mikazuki’s zori sandals appear to be completely pristine. 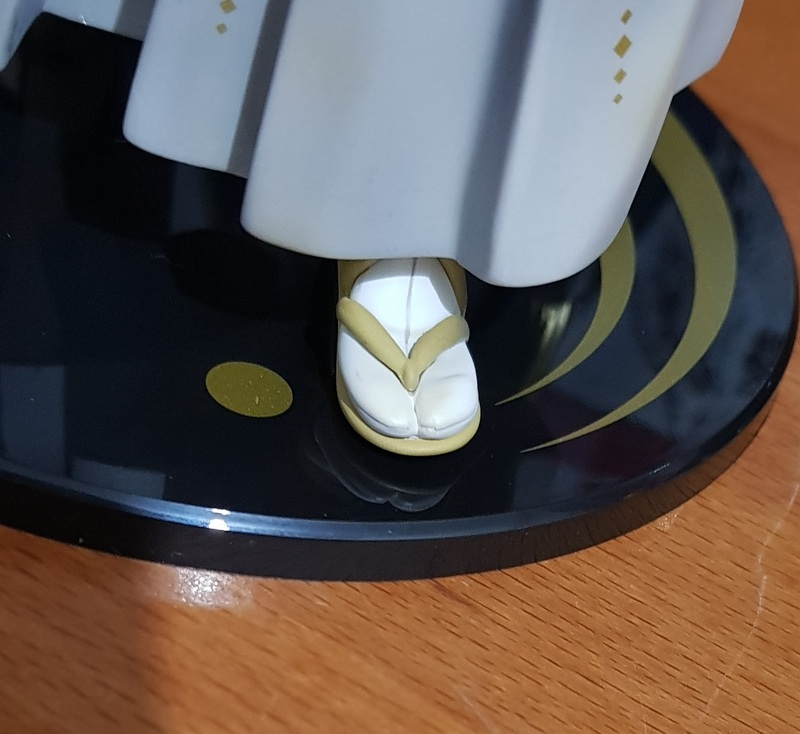 I feel that Orange Rouge could have definitely done a little more here to rough things up for his sandals, but this isn’t a very visible component of the figure and we probably don’t want Mikazuki to be fighting enemies in broken straw sandals, so let’s hold on to that thought! 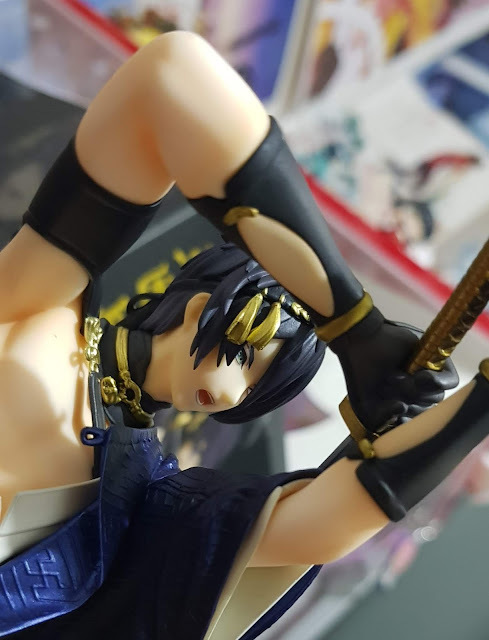 No Comment to " Figure Unboxing and Review: Mikazuki Munechika (Damaged version) "